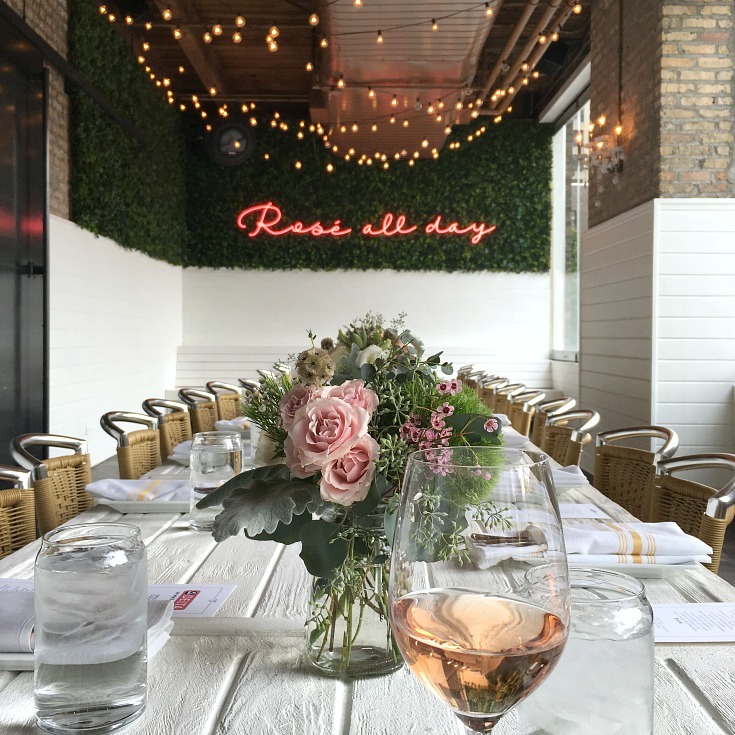 I’m so excited about today’s post recapping my trip to Chicago for an amazing “Day of Inspired Design,” hosted by the blogging team at Young House Love and sponsored by Delta Faucet®. 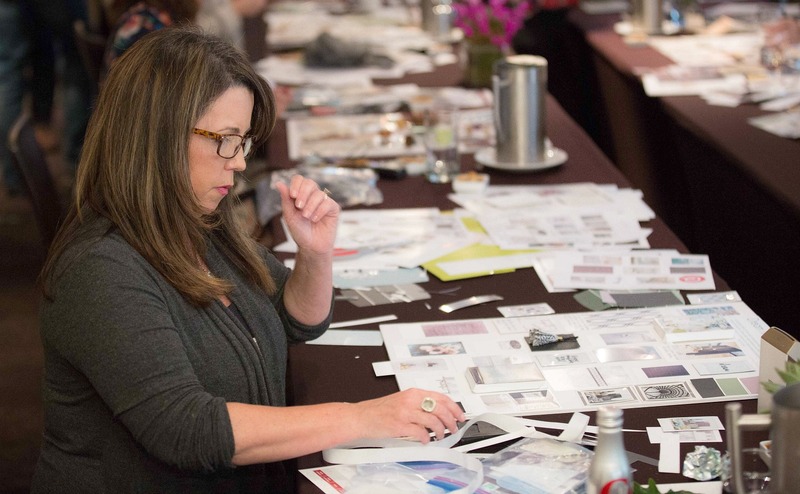 I came away with so many smart design tips, wonderful ideas and great inspiration that I can’t wait to share with you guys! 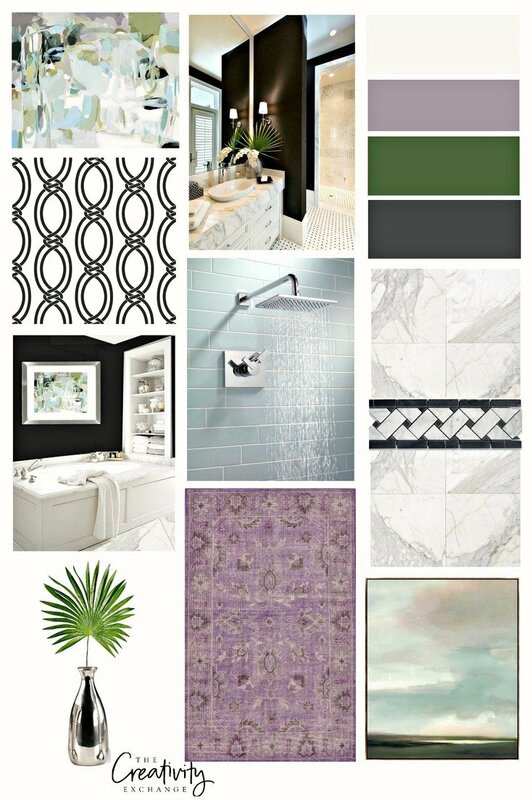 I’m also sharing a sneak peek of the plans for my guest bathroom remodel that came about because of the event! That’s right, a bathroom remodel! I am thrilled to announce that I have teamed up with Delta. Over the next couple months, I will showcase some beautiful design ideas and share bathroom remodel tips —all through the process of my own guest bathroom remodel that I will be sharing on the blog, from the initial planning stages to the final reveal in December. So, back to event details in Chicago. To kick things off, 10 bloggers, John and Sherry Petersik from Young House Love and the Delta team met a couple weeks ago for a day of architectural inspiration and great design tips. 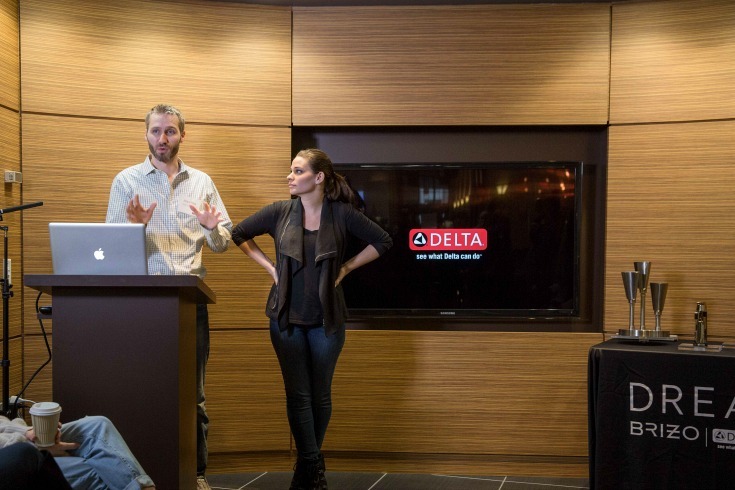 We started at Delta’s gorgeous flagship showroom in the Merchandise Mart. 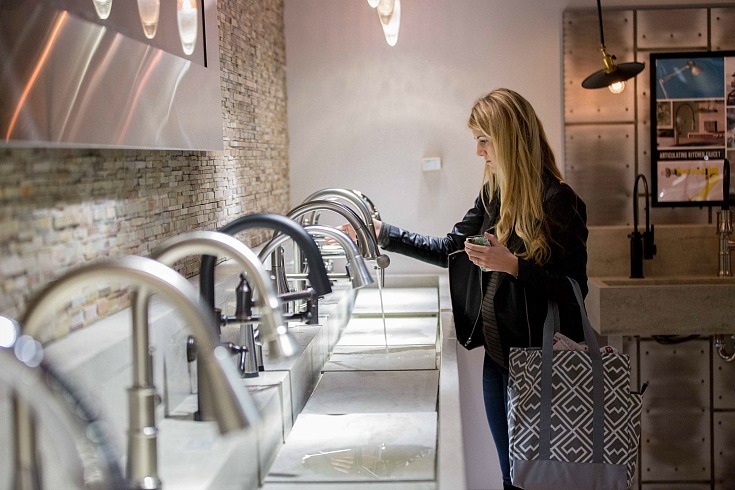 We looked all through the showroom and tested out all of the faucets. I was so impressed by all the beautiful designs and possibilities. We also heard from the Delta Faucet team about the new Delta Faucet Zura Bathroom Collection, which is really stunning! The Zura design is sleek and contemporary (I ordered the wide spread faucets for my bathroom remodel), I especially love it in the chrome. Next, John and Sherry from Young House Love shared some of their favorite tips and tricks for designing/remodeling a space. 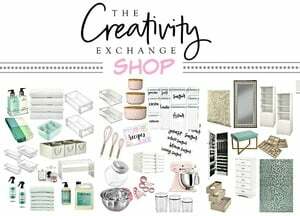 If you’re not familiar with Young House Love, they are the popular home/DIY bloggers with two fantastic books on creating a home that you love. I was definitely a fan girl getting to spend the day with them and soak up their great advice! One of my favorite tips that they shared was to push yourself to another level when designing/decorating a space in your home. In other words, look for ways to get creative and think about challenging yourself to go a little beyond your comfort zone. That’s where the best design ideas are found! The Delta team organized a morning architectural tour of downtown Chicago on an adorable trolley, so out into the city we went! 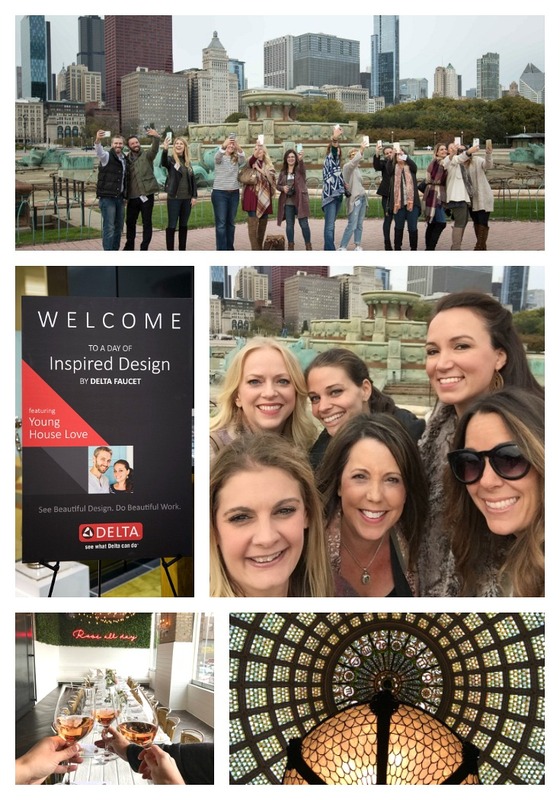 I love that the Delta team wanted to inspire and push us to find creative design ideas for our home/projects using Chicago’s amazing architecture as examples for us. In fact, we were challenged to take lots of pictures during our tour and incorporate them in a design inspiration board for our dream bathroom/kitchen later in the event. Inspired was an understatement! 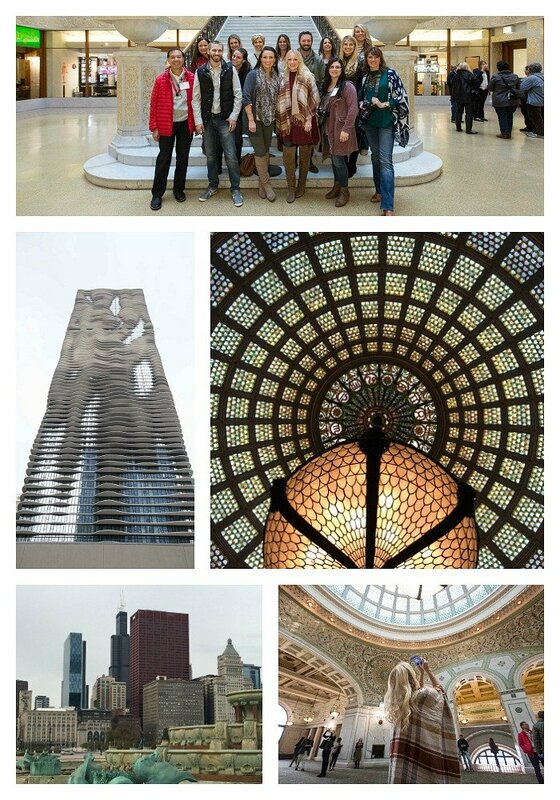 We toured the Chicago Cultural Center, where we saw the largest Tiffany Glass dome in the world. 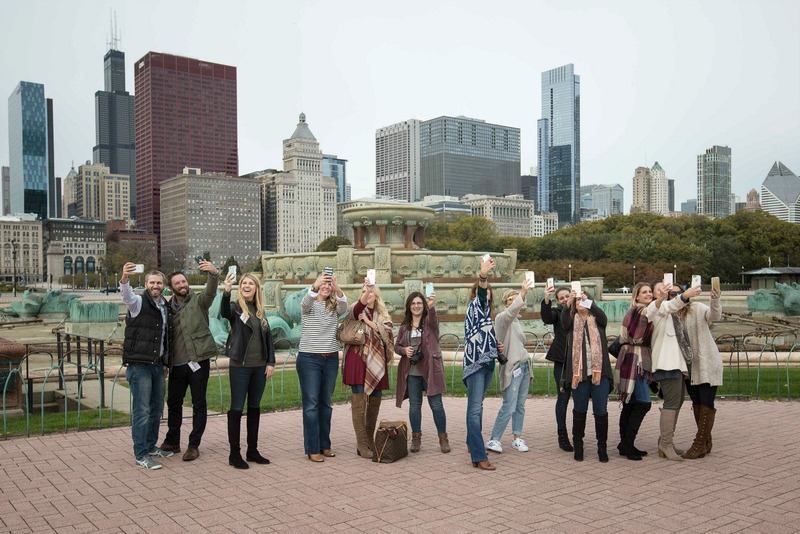 We also toured the Rookery, Buckingham Fountain and the breathtaking Aqua Tower. I took over a hundred pictures! 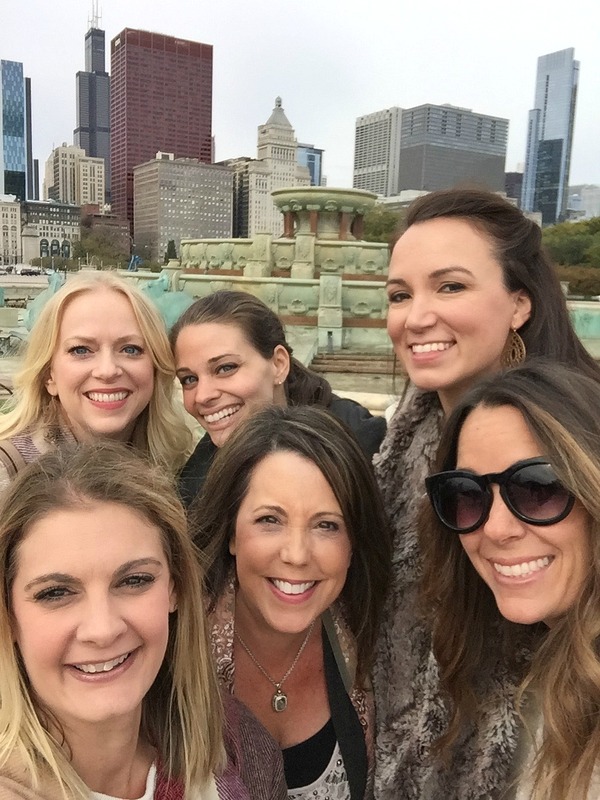 Of course, while we were photographing our surroundings, we had to take a few selfies, too! We just couldn’t resist with such an inspiring backdrop! 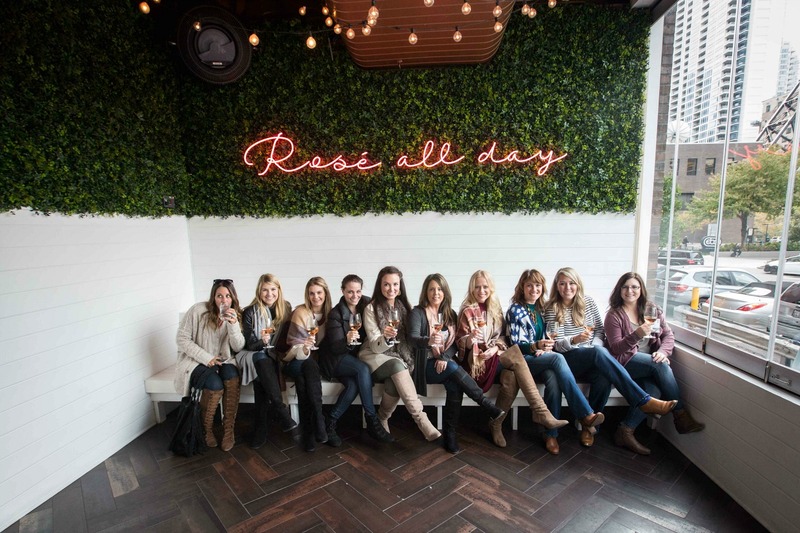 … a grass wall with a gorgeous pink “Rosé All Day” neon sign! Well, Rosé we did!! After a wonderful lunch, we headed back to our hotel to begin work on our dream bathroom/kitchen inspiration boards. 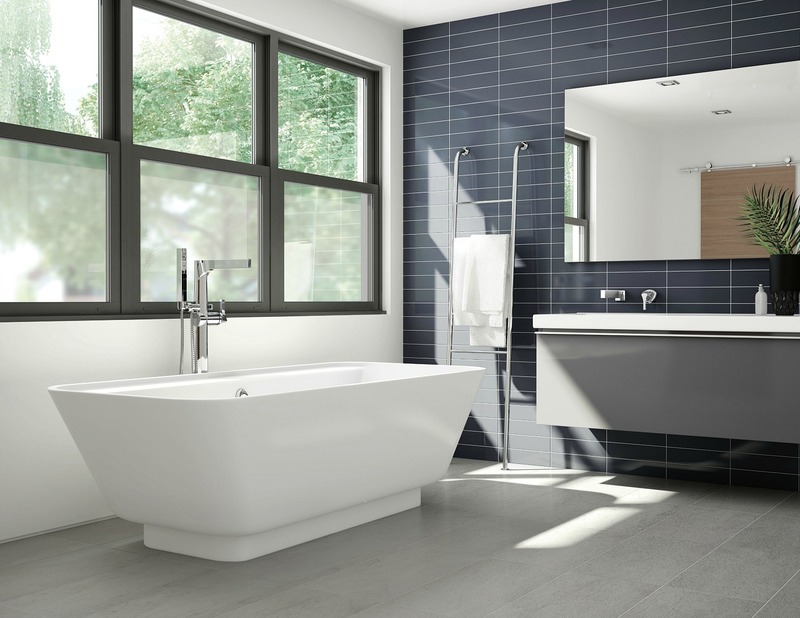 As part of the daylong event, Delta would select one of our 10 dream bathroom/kitchen design boards and award the blogger a full makeover to create the inspired dream space! We were given several key elements that we needed to incorporate on our small 18 x 24″ foam boards. (Did I mention small? Ha! I really needed a billboard to showcase my dream bathroom!) I’m pretty sure that’s exactly what I’m thinking in this shot working on my board. One of the categories that our boards were judged on was creativity, so I really tried to go over the top with design and put together the most creative board I could for my dream bathroom. We also needed to incorporate some of our inspiration/images from our earlier architectural tour. Did I mention I had over a 100 photos? Oh boy … I needed to come up with a creative way to organize my board and edit all my inspiration because we only had 2 hours to pull it all together! So I went into the challenge with images like this that I have saved over the years for my dream bathroom. I didn’t win, but I’m excited for my friend Beth from Home Stories A to Z who did! 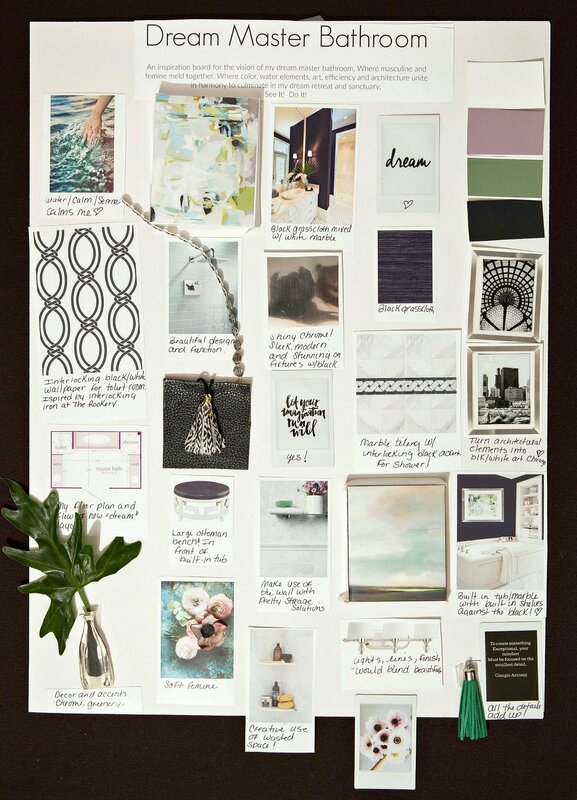 Her design board was beautiful, and she is busy planning her beautiful dream bathroom remodel now. 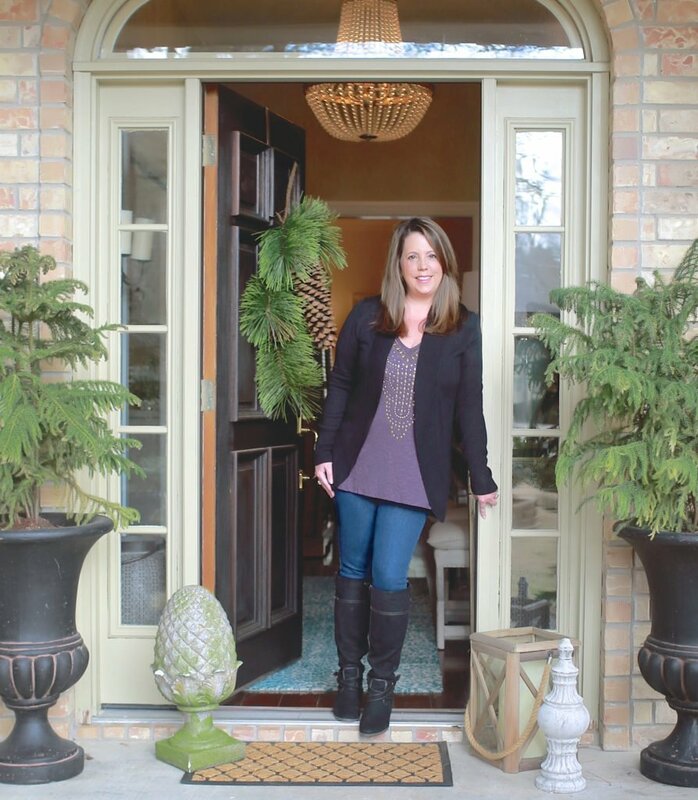 She will be sharing her dream bathroom remodeling plan and process on her blog, so be sure to check her out! It’s going to be so gorgeous! I’m ecstatic for Beth and I’m also happy for me. Even though Beth was the big winner, we all received fantastic Delta products, and I’m doing a mini-makeover of my guest bathroom in partnership with Delta! I’ll be sharing more details of my plan/progress next week! 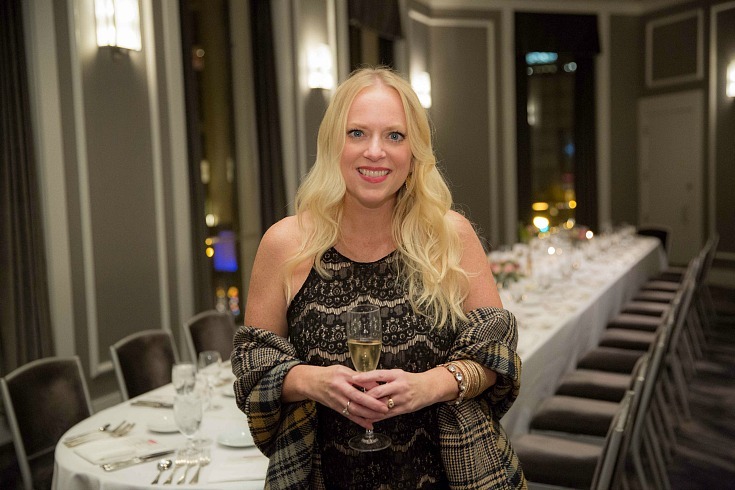 The event ended with a beautiful dinner looking out at the downtown Chicago lights. I loved spending the day being inspired and getting to know (or catching up with) my favorite bloggers and the amazing Delta team. 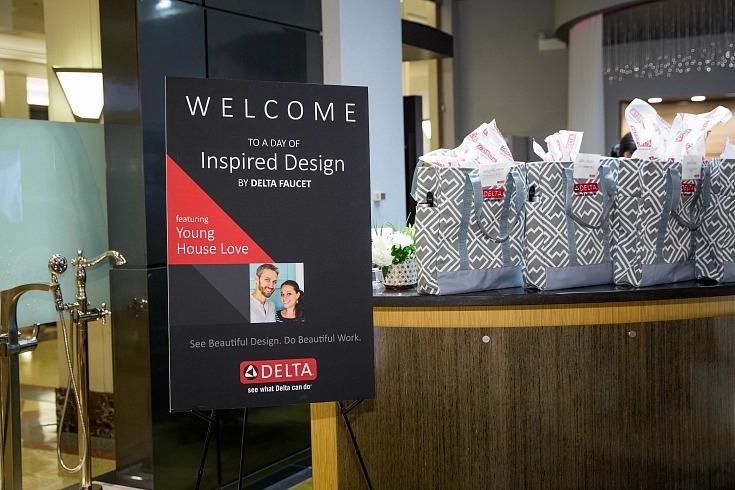 I was so impressed with what Delta challenged us to do and how more than anything, they wanted to inspire and connect with us where we share a common bond: beautiful inspired design. Thank you so much Delta for such a great day! Stay tuned because next week I’ll be sharing more of my dream guest bathroom plan, along with the details of the renovation. That sounds like a great trip Cyndy! Love your design board!